Well known Turkish-Cypriot researcher and journalist Ahmet Tolgay has just published one of the most interesting books to come out recently, the history of the cinema in the Turkish-Cypriot community. The book entitled in Turkish "Kibris Turk Toplumunda Sinema Olayi" was published by the Meral Birinci Foundation. The book tells of the great cinema going tradition of the Turkish-Cypriot community, how it all started and the first films shown in the cinemas in Cyprus. Did you know that the first person to actually show a film, in Cyprus, commercially, was a Turkish Cypriot named Mustafa Ali back in 1913. Many more interesting historical facts about the cinema in the Turkish-Cypriot community are given in full detail in this very interesting book. 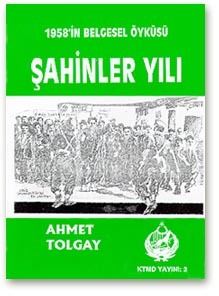 His latest books include '1958'in Belgesel Öyküsü: Sahinler Yili' published by Kibris Türk Mücahitler Dernegi Yayini (No. 2, Lefkosa). The book deals with the recent historical developments in Cyprus during the year of 1958. 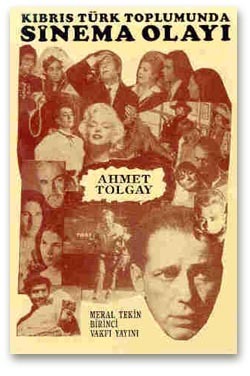 Ahmet Tolgay, (1995), "Kibris Türk Toplumunda Sinema Olayi", (arastirma). Taninmis Kibrisli arastirmaci, yazar ve gazeteci Ahmet Tolgay'in kitabi yayinlandi. Kitap Meral Birinci Egitim Kultur ve Spor Vakfi tarafindan yayinlandi. Yayinda Kibris Turk toplumundaki sinema olayinin tarihcesini cok iyi bir bicimde anlatiyor. Kitap Kibris Turklerinin sinemaya gitme aliskanligini, ilk sinemalari, ilk film ithal edenleri ve gelmis gecmis tum Kibris Turk sinemalarini anlatiyor. Ornegin, sinemayi icat eden Lumiere'den asagi yukari 10 yil sonra sinemanin Kibris Turk toplumunda basladigini biliyor muydununuz? Kibris adasina ilk film ithal edenin Mustafa Ali adinda bir Kibrisli Turk oldugundan da bahsediyor. Daha bilmedigimiz bir cok ilginc ve tarihi olayi, ve sosyal tarihcemizi anlatan bu kitabi okudukca begeneceksiniz.